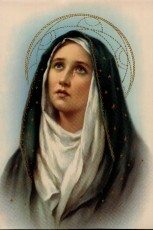 The Feast of Our Lady of Sorrows has been has been memorialized over many centuries, dating back to early 12th century. The Cistercians and the Servite orders promoted it in the early days. The Servite Order was also known as the “Servite Friars”, or the “Order of the Servants of Mary”. By the 14th and 15th centuries, it was widely celebrated throughout the Catholic Church, and in 1482 this feast was added to the Missal under the title of “Our Lady of Compassion”. Pope Benedict XIII added it to the Roman Calendar in 1727, and in 1913 Pope Pius X set the date as September 15th as the title “Our Lady of Sorrows”. This title, “Our Lady of Sorrows” focuses on Mary’s intense suffering during the passion and death of Christ. The “Seven Dolors”, the title by which it was celebrated under in the 17th century referred to the seven swords that pierced the Heart of Mary. This feast is like an octave, for the birthday of Our Lady on September 8th. This title is dedicated to the spiritual martyrdom of Mary, Mother of God, and her compassion with the sufferings of her Divine Son Jesus. In her sufferings as co-redeemer, she reminds us the tremendous evil of sin and shows us the way of true repentance. The Seven Sorrows of Mary are scripturaly based. The Seven Sorrows of Mary are Popular Roman Catholic Devotion. They are devotional prayers, which consist of mediation on her Seven Sorrows. Also, there is a corresponding devotion to the Seven Joys of Mary. The term “Sorrowful and Immaculate Hear of Mary” refers to the combined devotion of both the Immaculate Heart of Mary and the Seven Sorrows of Mary. Mary, as Mater Dolorosa, is and has been for centuries, the subject for many artists and for Marian art in the Catholic Church. Mary as the Mother of God suffered tremendous spiritual sufferings. The most notable one of the Seven Sorrows of Mary was the Passion and Death of her son Jesus. For many centuries the faithful have been devoted to these sorrows of our Spiritual Mother Mary, and have meditated on her tremendous sufferings. She teaches us that our sufferings, united to Christ’s through her sorrowful heart, can become bearable.